In the New Zealand climate moles are very common. At Vital Face and Vein we use the Ellman Surgitron machine to excise moles and skin lesions. Cosmetic Radiosurgery by Ellman Surgitron® allows the removal of cosmetic lumps and bumps on the face and body with virtually no risk of scarring. The high frequency, low temperature technology developed by Ellman International is optimised for applications where minimal collateral tissue damage is desired. It’s important to know that Surgitron is not always possible; this will be assessed at your consultation. Radiofrequency Ellman Surgitron® is used to remove raised moles, skin tags and pre-cancerous lesions. Using the Ellman Surgitron unwanted protruding moles, skin tags and scaly lesions are able to be removed by a simple and delicate radiofrequency shave procedure by our experienced Cosmetic Doctor. Your mole or skin lesion will first be checked by our Doctor. Any lesions of concern will be sent to the laboratory for testing. You’ll be given a local anaesthetic, so you won’t feel any discomfort. It also means there is no cutting or stitching required. Radiofrequency surgery successfully removes raised moles, lumps, bumps and scaly lesions with little to no risk of scarring. Lesions are simply vaporised away. Radiofrequency surgery is minimally invasive, removal of the lesion leaves a flat raw area that heals over 2 to 10 days and a dressing is usually only required for a brief period. Skin in the treated area may have a darker or lighter colour initially and may be a little red. This will fade to normal skin tone over time. The Ellman Surgitron is made in the USA and is the leading and safest available technology. Skin cancers can be biopsied or removed and sent for histological testing at SCL Pathology. 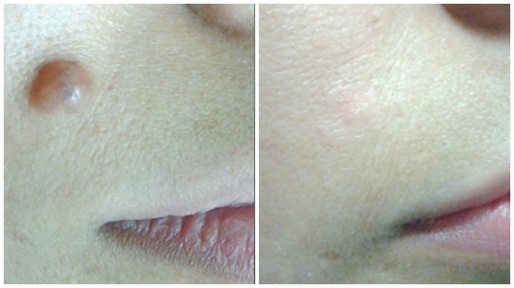 Broken capillaries and red veins on the face are also be removed using the Ellman surgitron. Results are instant and often only one or two treatments are required. Some skin lesions will require excision, this and all options for treatment will be fully discussed with you prior to treatment. WHAT IS MOLE/SKIN TAG REMOVAL? Radio Wave technology uses high-frequency energy which passes through a disposable fine wire electrode and can be used to remove raised lesions and moles on the skin without a surgical scalpel incision or stitching. Healing is quick and discomfort minimal with virtually little or no blood, bruising or swelling. A local anaesthetic is injected, which make this treatment virtually painless. One visit is normally all that is needed. The treatment is usually completed in under 30 minutes. 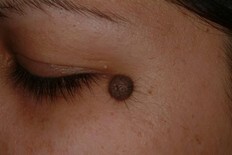 The mole or skin tag will be covered with a micro bandage. Over the week the area heals by forming new pink new skin. Do not pick or scratch the area while it’s healing. The area will continue to mature over the next months, eventually fading to match the colour of the skin.